McCain Pedestrian Signal Housing - J.O. 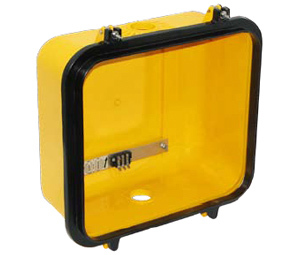 Herbert Co., Inc.
McCain’s Pedestrian Signal Housings are designed to be used in conjunction with standard or LED pedestrian signal modules to promote pedestrian safety at intersections. McCain housings exceed the Institute of Transportation Engineers (ITE) standards, offering a low maintenance and durable housing in either die cast aluminum or injection molded polycarbonate resin. They are available in 12” or 16” styles, and the 12” housings are available in 1-section or 2-section varieties. The 12” polycarbonate housings are reinforced with a 10 percent fiberglass fill for superior strength and durability unmatched by standard polycarbonate resins. The fiberglass fill is optional on the 16” polycarbonate housings.